Some key structural market & commercial trends are driving the evolution of flexible midstream gas asset owner’s commercial strategies. This decade has been a tough one for owners of flexible midstream gas assets such as storage, pipelines & regas terminals. Asset returns have been hit by a post financial crisis overhang of supply flexibility in the European gas market. At the same time, market drivers are structurally altering the risk/return profile of midstream assets. But as is often the case, commercial strength is born from adversity. Midstream asset owners are improving returns by evolving commercial models and optimising margin & costs. A combination of sharper commercial strategies and recovering market fundamentals is set to underpin midstream value recovery into next decade. 5 ways asset owners are responding to boost value capture. While 1. applies generally across all midstream assets, our coverage of 2. and 3. focus on flexible TPA exempt assets. Import dependency: European domestic production is in structural decline. This means the European gas market is becoming more dependent on longer import supply chains e.g. LNG imports and Russian pipeline flows from Western Siberia. Longer response times increase market price volatility and the frequency and magnitude of price shocks. Power sector swing: Gas fired power plants are set to play an increasingly important flexibility provision role over the next 5 years. Regulatory driven closures of nuclear, coal and lignite plants will increase gas plant load factors. In parallel, the requirement for flexibility is set to rise with a substantial increase in intermittent wind & solar output. The increased ramping of gas-fired power plants depends on supply flexibility from the gas market. Ageing infrastructure: European midstream gas infrastructure is ageing. Yet investment in both maintenance and renewal capex for midstream assets has been relatively low this decade given weak market price signals. Infrastructure outages and retirements are likely to increase as a result into next decade. These drivers are underpinning a gradual recovery in flexibility price signals since 2016. This recovery has been more pronounced in the UK market with the closure of Rough. But TTF volatility has also been rising in 2018. These structural market drivers are supporting several key commercial trends impacting midstream value capture. The market drivers described above are resulting in important trends in the way TPA exempt midstream asset owners are capturing value. These are summarised in Table 1 below. A rising portion of asset value is being monetised closer to delivery (e.g. within-year, within-month). Structural market trends above support continuation of this trend (e.g. LNG import swings, power sector intermittency). Increased import dependency means the European market is relying on longer supply chains (e.g. LNG, Russian pipes), with longer response times to dampen market stress. Ageing infrastructure is resulting in more frequent outages. Legacy long term contracts used to support midstream asset development are rolling off & can’t be replaced at the same terms. There is a structural trend towards shorter term contracting in the European gas market as hub liquidity improves. As contracts roll off, value shifts to the prompt and volatility increases, more market risk is being pushed onto midstream asset owners and investors. With that higher risk comes the potential for enhanced returns. In other words, there is a structural transition in asset risk/return profiles that favours companies with the ability to absorb market risk and the commercial capability to manage that risk and commercially optimise asset returns. Midstream asset owners have not been idle in responding to these evolving market and commercial trends. 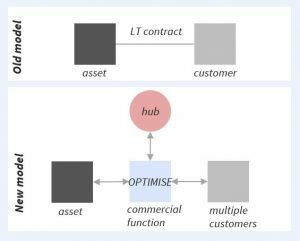 Midstream business models are adapting to reflect the increasing importance of optimising physical asset flexibility against hub prices to provide a more targeted range of customer products and services. This business model transition is summarised in a simple schematic in Diagram 1 below. An enhanced commercial function sits at the centre of the new midstream business model. This often consists of only 2-4 capable commercial staff. And it does not necessarily involve a trading function and associated overheads. There are examples of both pipeline and storage operators in Europe that retain asset flexibility into the day-ahead horizon to enhance value capture, before selling capacity to trading counterparties with direct market access. In Table 2 we list five ways midstream asset owners are enhancing value. The actions in Table 2 can significantly enhance midstream asset margin, even in the absence of any flexibility market recovery. But these are also powerful tool to enable asset owners to maximise their benefit of market recovery, rather than that benefit only flowing to customers. Jessica Gervais has joined Timera as a Senior Analyst. She has 10 years commercial and analytical experience in European energy markets. She joined Timera from Platts Analytics (formerly Eclipse) where she was Head of Modelling for European Gas & Power. Prior to this, she led the development of ArcelorMittal’s European gas trading capability, with responsibility for optimising energy sourcing across multiple hubs in Europe. More details here.